It was Scotland as you never knew it! Blue skies and sunshine for the duration! The weather was fantastic and the only thing that the Scots could not claim credit for. 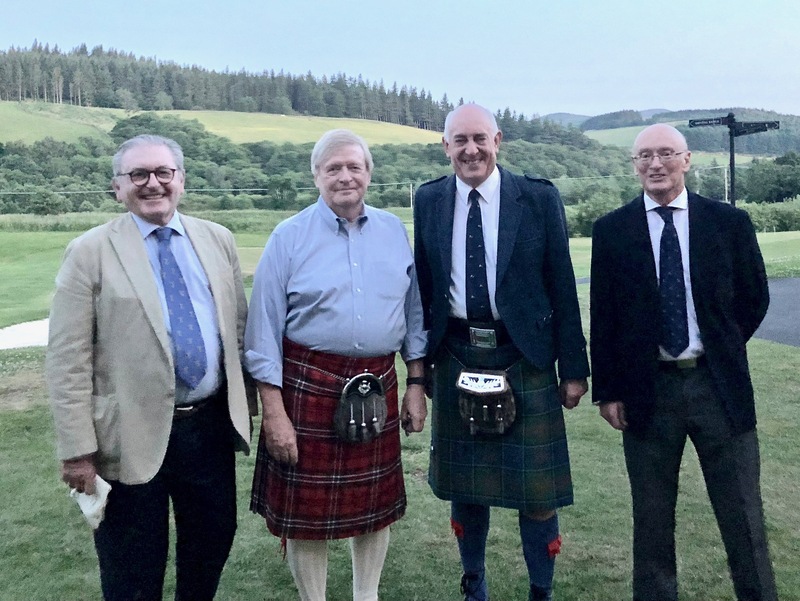 Everything else was wonderfully arranged, principally by David Newton and David Bone with their wives Heather and Georgina looking after those who were not playing golf. Culture was provided by a great visit to Neidpath Castle where we also had drinks and a meal. And then there was the golf. Played twice at the hotels own course, Cadrona and once at Peebles . Very different but both challenging and scenery to die for. On the first day the Scots beat the LSGC, and Ontario beat the Paris bar. The next day Ontario continued their winning way against the Scots whilst LSGC drew with the Paris Bar. Final day saw Ontario and Scotland winning over LSGC and the Paris bar. Overall Ontario came first, Scotland second, LSGC third and Paris bar fourth. But everyone was a winner in playing golf on good courses in perfect weather, and then talking about it all over a drink or two.